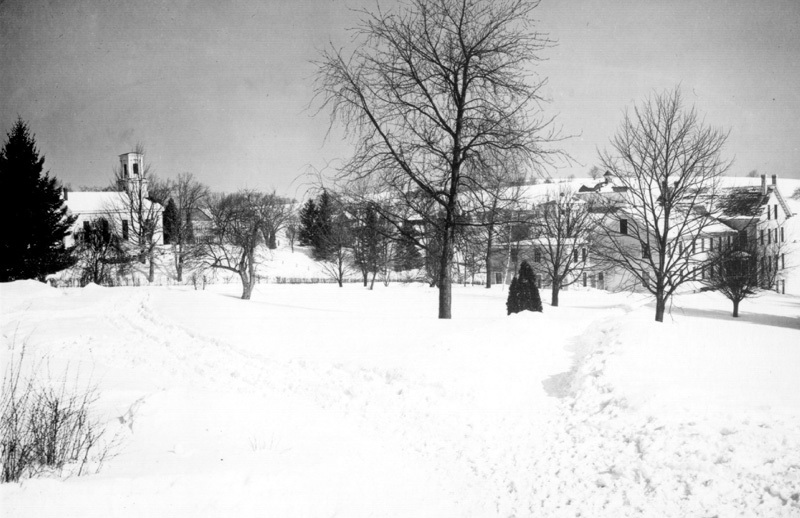 The congregation’s third Meeting House, built in 1848, overlooks a snowy scene in 1907. On the right is Old Whitney Hall, a former orphanage and first building of the Storrs Agricultural School, which today is the University of Connecticut. The history of the Storrs Congregational Church begins in 1737 when the Connecticut General Assembly authorized formation of the Second Ecclesiastical Society in north Mansfield. Its parent church was the First Church of Church in Mansfield, Congregational, and its grandparent, the First Congregational Church in Windham Center. On October 21, 1921 the church was incorporated as the Storrs Congregational Church. Established in order to be easier to access by residents in the northern parts of the town of Mansfield, when the area was simply rural farmland like much of eastern Connecticut, Storrs Congregational has continued through its over 275 years a ministry of meeting people where they are… even as how we define “where they are” changes in each new era. From easing geographic access when hauling horse carts many miles up and down steep hills was a real difficulty, to providing a religious community for students-away-from-home at the newly forming state agricultural college, and to finding ever new ways to open wider our physical and spiritual doors to all, our identity and mission as a Christ-called and Spirit-gathered community reaching out where people are has never changed. 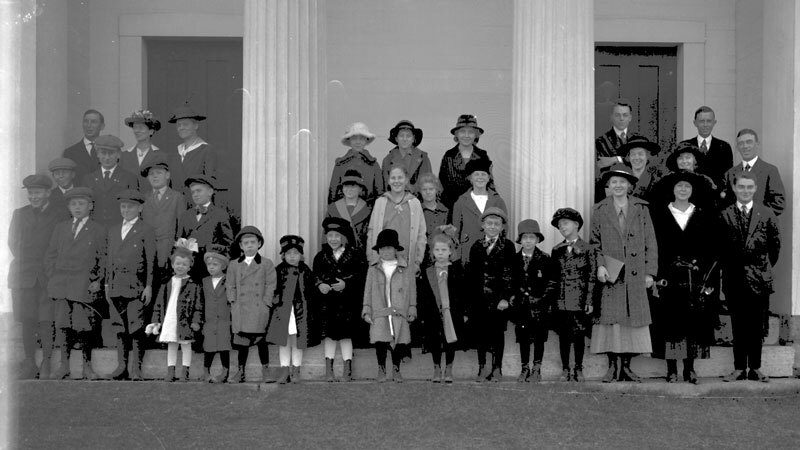 Sunday School children and their teachers, circa 1918. In the third row, far left, is Rev. Marshall Dawson, who was pastor in the early 20th century. Also in the third row, second from right, is G. Safford Torrey, a botany professor for whom the UConn Life Sciences Building is named. In the 1820s, “the cause of foreign missions began to excite the interests of the people of this country,” wrote Gilbert Southwick in the first published history of the church in 1879. Southwick reported that Pastor William Ely “advocated the cause with Christian activity and zeal.” It began a tradition of mission and outreach that is a vital part of the Storrs Congregational Church in its third century of ministry. As Sunday schools were beginning in the 1820s, Elisha Williams was superintendent of the first “Sabbath School” organized about 1822. It was the forerunner of the Christian Education and Faith Formation endeavors of the church. The first meeting house was built in 1745-6, located approximately where the present and fourth church building, constructed in 1927, now stands. The tracker organ in the rear balcony of the sanctuary was completed in September, 1981, and the sanctuary renovated in 1986-7 as one of the projects commemorating the 250th Anniversary of the church. The meeting house bell tower became the home of the University’s Austin Cornelius Dunham Carillon commissioned by the Board of Trustees of Connecticut Agricultural College in 1930. The Carillon was refurbished in 2011 and expanded with additional bells. The Parish House was erected in 1926 with statewide contributions and donations by individuals, groups, and churches starting the tradition of a community gathering place–even used as a ‘student union’ space for university until the early 1950s. The Education Building and Waggoner Chapel were completed in 1960. Our Waggoner Chapel is open 24 hours for prayer and meditation. For its first 150 years the church ministered to a rural congregation not unlike many others in Eastern Connecticut. The next 100 years reflected efforts to meet the spiritual needs of a growing academic community. The church has opened its facilities to services by Jewish, Roman Catholic, Episcopal, and Lutheran groups, and most recently to the Storrs Korean Church. The Rev. 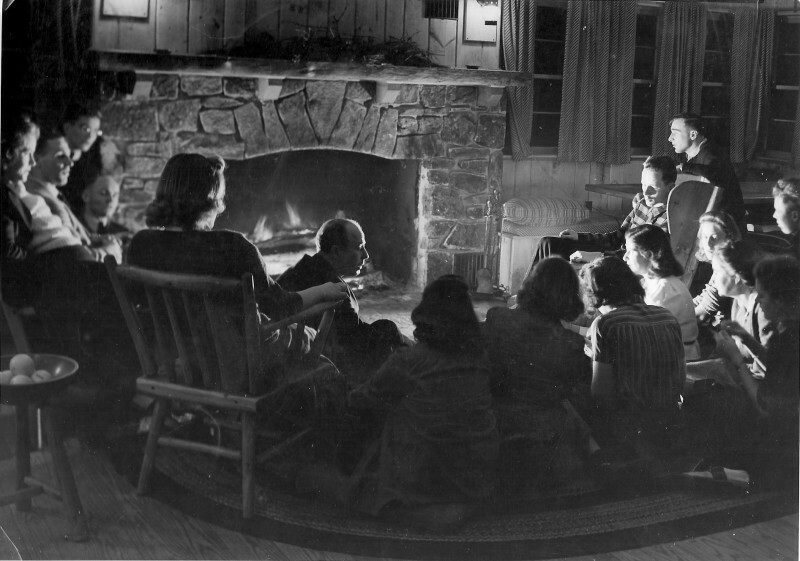 Dr. J. Garland Waggoner gathers with university students at a retreat in the 1950s. Until 1932 the church provided religious education with college credit for students and until 1960 the minister served as college chaplain. The Parish House served as a center for campus educational and social needs until 1952, yet is still utilized by student and other campus organizations. We celebrated the 275th year of Storrs Congregational Church in 2012 with a series of events that honored our past and looked to our future. With the Tree of Life as our symbol, we held events and activities that brought together the generations of church members with times to laugh and play together, to get to know one another better, and to worship together in a meaningful way.